As it says on it, the upper image is of the lodge and gates to Witton Park (while it was still the Feilden residence, I assume). I've no idea who the man is. He could be one of the Feilden family, but more than likely one of their workers, the lodge keeper or maybe a gamekeeper of some sort. 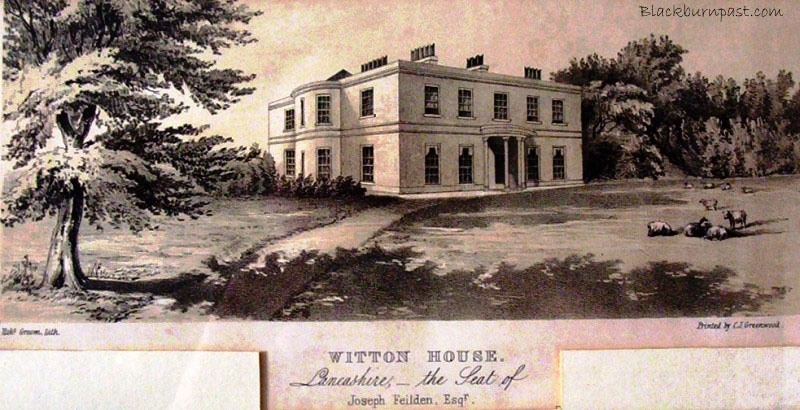 The lower image is an 1840's print of a lithograph, of the house itself. It's a framed print that I have on my living room wall, hence part of the mount still showing in the bottom corners. I didn't want to crop off the title / inscription. 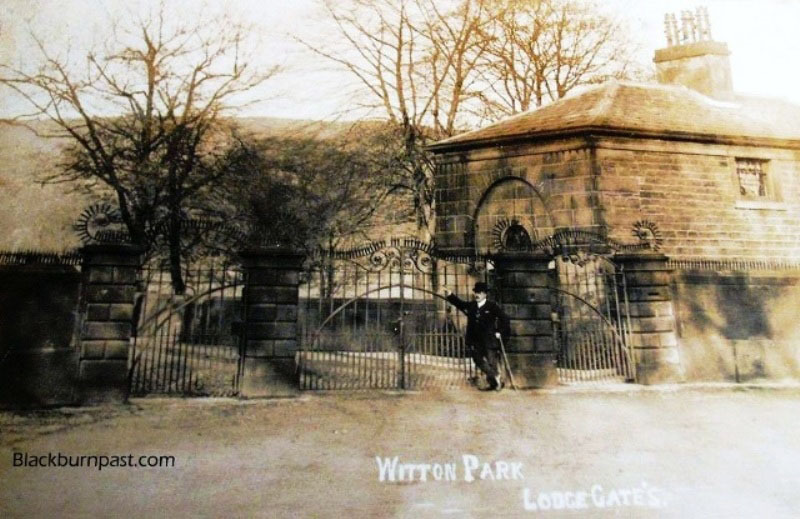 Would those gates in the top photo have been where the main entrance to Witton Park is now Colin. Or where they on Buncer Lane ? I'm pretty sure its the main entrance John, as you can see Billinge Hill in the background. If it was the gateway facing St Mark's church, I don't think you would see much of a hill, though the land does rise were the cemetery now is. Had a quick look on an old diagram I have of Witton House grounds (1912) and there's a black block (indicating a building) to the right of the Preston Old Rd gates, but when you look at the Buncer lane gate, there's nothing at either side. So though I'm not 100% certain, I'm pretty confident it's a photo of the main gates. And the wall just behind the lodge seems like it could be spanning the River Blakewater. My Great Grandfather Michael Hartley and his wife Catherine worked for Major Fielden and lived at the lodge. My ninety one year old aunt remembers going to visit them when she was a girl. She remembers them bringing in the cows.The lodge was on Preston Old Road. Thanks for this. That means your aunt was born in 1919/20, so if she remembers visiting the lodge, she must have been at least 5 or 6 years old, which in turn means the lodge was still there circa 1926 ish? (and possibly much later?). Have you any more pictures please ? Hi - If you mean more pics of Witton House, I do have a few in books, but due to copyright, I'm often reluctant to post them. That said, they are the more common shots of the house, so you've possibly already seen them. I don't have any more of the lodge. If the house has since been demolished how is copyright an issue? The house would have been long demolished when the books were published, yet it says in the front of the book all the images are copyrighted. Contact the Lancashire Telegraph (it's their publication) and ask them your question. Yeah I've seen the photos on various Facebook groups. I'm not too sure what they're hoping to find down there to be honest. It's not an ancient site by any means. The house was still there into the 1940's or so wasn't it? I'm sure the Feilden Estate Office (which was on Richmond Terrace) would have had detailed plans of the layout of the house and I'm pretty sure that when they closed the office down, the vast majority of the documents from their estate office were given to Blackburn Library, who probably still have them all archived. Those archeological digs are often carried out when they know a site is going to be built on. I'm not saying plans to do so are imminent, but it's food for thought. Watch this space as they say. With the new school going up relatively recently, then the sports grandstand, it wouldn't surprise me if more buildings are planned. Did they not recently move the visitor centre too. I'm sure I read somewhere that the Witton one was closing and it was moving elsewhere. In 1905-1912 my Grandfather (Joseph Charles Farmer) was Foreman gardener for Captain James Hartley Gilbert Feilden of the Gardens, Witton Park, Blackburn, Lancs, where the head gardener was H Boyd FRHS.